HI, I`m April. I was adopted out from Mickaboo a couple of years ago, but sadly my parent had to let me go, so I am back with Mickaboo and ready to try for a new forever home. 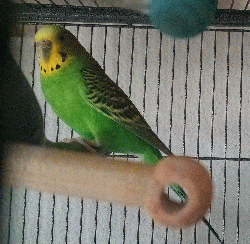 I am a spritely little typical girl budgie and I am enjoying being in a cage with several other girl budgies. I am not tame but I am fun to watch and listen to! Would you like to enjoy spending time with me in YOUR forever home?